This is inspired by Martin O's Wizard City stuff. It's awesome, check it out. I haven't played a lot of Lamentations but what I have played showed me that being a wizard at low levels did not feel very magical. This is completely understandable for a game that is focused on low magic settings and resource management but does not lend itself well to high magic games without much concern for mundane resource management. One thing that might help with this is cantrips. For those not familiar with 5e or GLOG, cantrips are level 0 spells that can be cast over and over again without cost. So in order to add flavor to magic users in low magic systems here is a list of wizard gimmicks paired with cantrips for variety and cool factor. Grass Wizard: All your hair is made of grass. You can speak to grass and create a 10ft long grass tendril that deals 1d3 damage and can manipulate objects. "Grass" Wizard: You are perpetually surrounded by a cloud of sweet smelling smoke. You can create a 10ft diameter cloud of smoke within 20ft of yourself that you can control. You can only create one of these clouds at a time. Shrunken Head Wizard. You have a lot of shrunken heads, basically infinite shrunken heads. These not only act as your "spellbook" but your empty heads can record a few seconds of sound and repeat it perfectly with only your psychic command. So they can begin repeating the desired sound even when you are not present. Third Eye Wizard: Your third eye is always open and it is always judging those around you, you can put this eye down and see through it. The eye will also roll around at your command. Stone Wizard: You are perpetually orbited by little chunks of stone. You can throw these at a range of 20ft, dealing 1d3 damage. You can also manipulate up to 5lbs of stone that you can see with your mind at will. Shadow Wizard: You can control the shape of your shadow. You cannot, however, control the direction so the light source which casts your shadow still needs to be in the right place. You can also teleport things that your shadow can touch into your hand. Objects teleported this way can only weight up to 5lbs and must fit in your hand. Marble Wizard: You can telekinetically control all the marbles you can see. You start out with a 5lbs bag of them. Hat Wizard: You wear lots of hats. So long as you have someone's hat, you can summon a copy of their mind to inhabit the hat and speak through it. This mind will believe that it is the original and act with exactly like the original. Fingernail Wizard: You can grow your fingernails up to 10ft and increase their density. Scratching deals 1d4 damage. People don't like you much. Mold Wizard: You can cause mold to grow over any moldable surface you touch in a 5ft by 5ft cube. Not fun at parties. Sleep Wizard: You can fall asleep on command. Not sure if this is magic or narcolepsy. Shark Head Wizard: Your bite does 1d6 damage. You can breathe underwater. You have a shark head. Mr. Who? : You are forgettable. Literally. Anyone who has had a passing interaction with you must make a save to remember that you were even there. This doesn't work if you have done something memorable. Even people who know you will call you by the wrong name. Tummy Rumble Wizard: You can projectile vomit at a range of 30ft. Your face is always a little green. He Who Smelt It: You can create a stinking cloud within 30ft. You should not eat beans. Stool Wizard: You can become a stool at will. It is always the same stool from a bar called El Chico's in Tombstone, Arizona. Punch Wizard: A creature you hit with an unarmed attack takes 1d4+Str mod damage. No one is brave enough to tell you this isn't really magic for fear of your right hook. Would You Care for a Game of Chance? : You have a coin that always lands heads up when you flip it. This is a lame party trick. Pocket Sand Wizard: The most powerful wizard alive. Whenever you reach into your pocket, there is always a perfectly throwable quantity of sand, perfect for temporarily blinding foes. This is fantastic. I kind of want to run a game where all magical powers are roughly this effective. 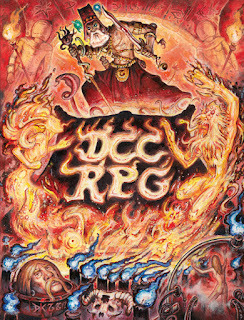 What's the deal with DCC? I am a writer, interested in breaking into the exciting and weird world of science fiction and fantasy. This is where I keep some brain babies, mostly related to my role-playing games hobby and world building. These babies may come with tentacles or thousands of unblinking eyes, but I love them all the same.